So what's on the menu at Fort St. Vrain? While we were up in the nest, I decided to collect prey remains. We don't have the necessary permits to take feathers (of which I found only two, both belonging to prey), but there were plenty of skulls and a few turtle shells. I got them home, laid them out on a table, and started ID'ing them. Some Moms bring home t-shirts and postcards. 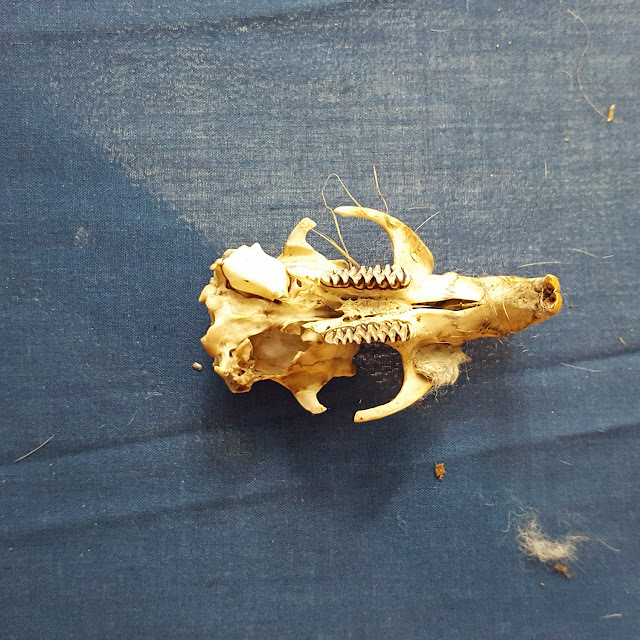 I bring home skulls and photos of prey. The photo below shows all of the remains I recovered from the nest, along with the book that Elizabeth Ries and I used to identify them. 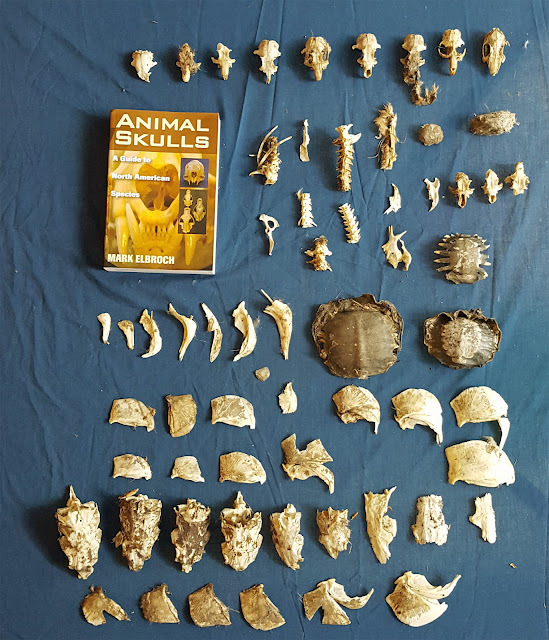 In all, we found 35 fish remains (skulls, skull fragments, opercular bones, jawbones, and an otolith), seven prairie dog skulls and one foot, one desert cottontail skull, one common muskrat skull, three western painted turtle shells, and some unknown vertebrae. Even in a relatively dry environment, the eagles show a clear preference for fish. As you can see from the opercular bones and skulls, some of the fish were pretty large! This blog will deal with mammal remains! To make the job easier, I started by assuming that most of the mammalian skulls were probably prairie dogs given the close proximity of a prairie dog colony to the nest. We divided them into groups of skulls that looked alike (which of these things is not like the other?) and got the skull book out! Take a look at the skulls above. 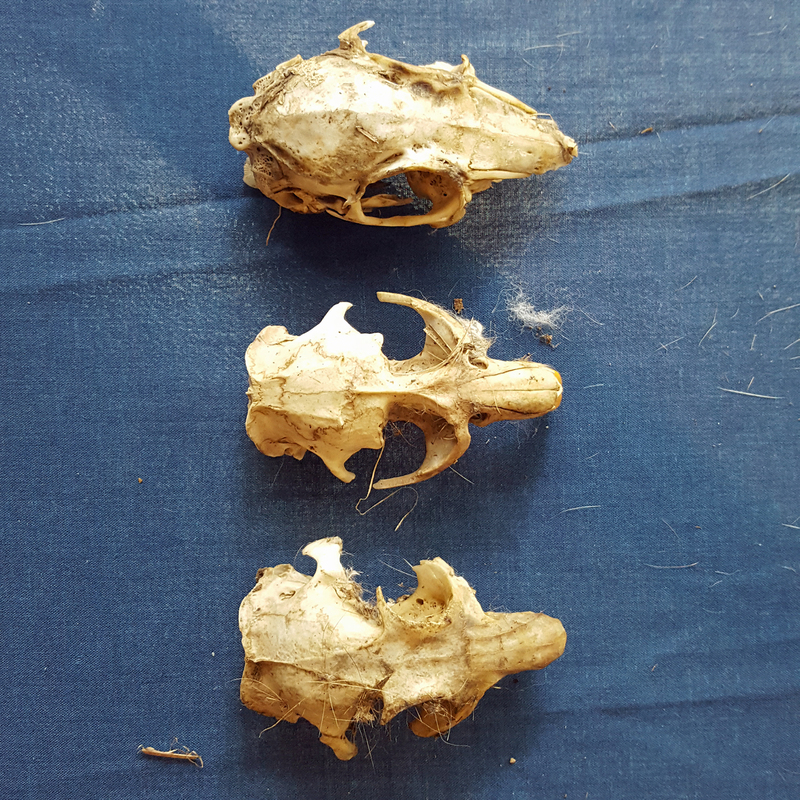 The top skull is quite a bit different than the other two, with a high, rounded top and a slightly different eye socket and muzzle (although much of the muzzle was gone). The bottom two skulls are flatter, 'boxier', and have different suture patterns. I decided to start with the bottom skull, since we had seven of them and just one each of the other two. Sure enough, Animal Skulls, A Guide to North American Species verified that we had a black footed prairie dog! Our skull had well developed post-orbital processes (the bone spurs jutting out almost perpendicular from the skull over the eye sockets), v-shaped temporal ridges (the 'V' on the skull), well-developed occipital crests (the ridge at the back of the skull), and (not real visible in this photo) broad nasals with squared posterior edges. It was a prairie dog! But what were the other two? I started by thinking about the animals I had seen around the nest. How about a rabbit? 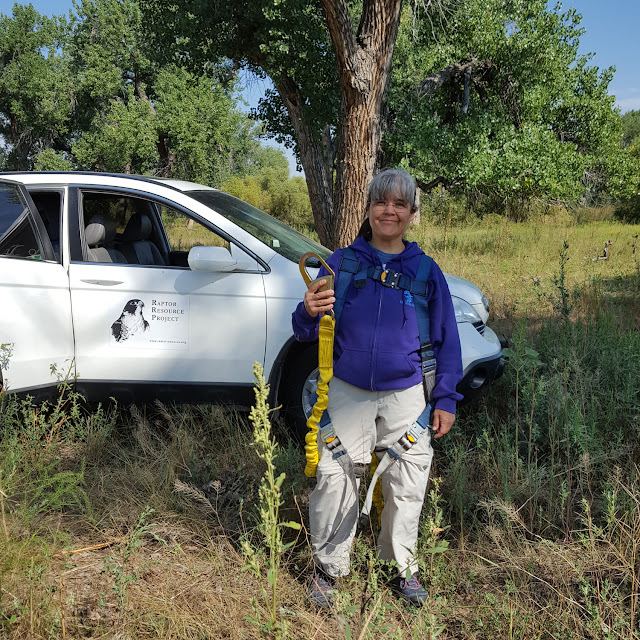 Elizabeth and I began with looking at what kind of rabbits lived in the area. After a lot of comparison, we settled on a desert cottontail. 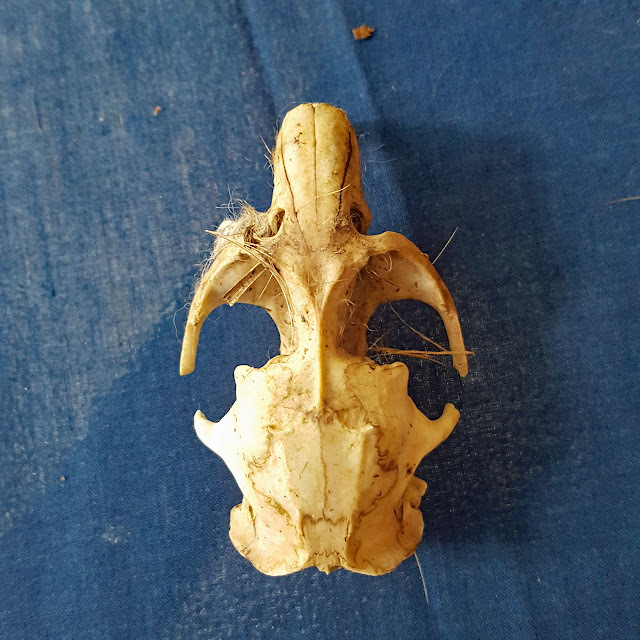 The skull has a relatively round, large braincase, the eye sockets are similar, with a posterior extension that is "long, broad, and often fused to the braincase" (this helped us rule out brush rabbit), and a broad and high intraorbital region, or top of the skull. Elizabeth suggested we take a look at the ventral, or underside, of the skull. Good idea! This turned out to be very helpful! She observed that the teeth lined up exactly with the desert cottontail's teeth, the heart-shaped structure at the top of its mouth formed by the palatal bridge begins near the anterior of the second cheek tooth and terminates just into the fourth tooth, the incisive foramina are large, and the skull has a medium forum magnum that resembles the one pictured in Skulls. Unfortunately, we didn't have a mandible to compare, but I feel pretty comfortable calling this a desert cottontail. Since the ventral view was so helpful in identifying mystery skull #2, we decided to start with the underside in skull #3. Wow - look at those distinctive teeth! This should be easy! The teeth were distinctive, but not as much as we hoped. We eventually ruled out northern pocket gophers. Like this skull, they have smooth incisors, but the skull shape was all wrong. We went on to rule out other types of pocket gophers and eventually just ended up looking for teeth that matched the skull as I racked my brain to think about what else could be out there. And then we found the muskrat skull. Voilà! It was a muskrat, not a pocket gopher! Muskrats are semi-aquatic rodents found all over the United States, including Colorado. The skull has orange, smooth mandibles, the anterior edge of the squamosal has a strong angular projection (look at the squared off ridges protruding over the eyesockets), giving the braincase a 'squared' appearance, and its temporal ridges are developed (look at the back of the skull). The teeth descend in size to the posterior, the first lower molar has five closed triangles or loops, and the incisive foramina (aka the long slits visible in the roof of its mouth in the ventral view) are long and thin, with the posterior edges aligned with the anterior edges of the toothrows. Elizabeth and I found the skulls quite fascinating. We discussed the distinctive teeth of the muskrat, which is the only mammal of the three to eat underwater. Its short tooth 'plate' allows it to grind tough fibers behind closed lips, which keeps water from running down its throat. 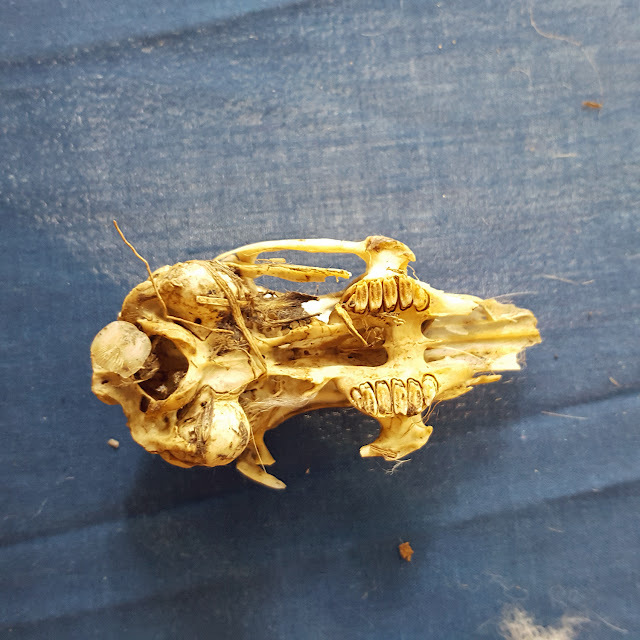 We noted the high, rounded skull and facial tilt of the rabbit skull, which may help it to leap and bound - something neither prairie dogs nor muskrats do - by keeping its nose down and out from its line of sight. And we talked about the high post-orbital processes of the prairie dog, which also occur in some squirrels and marmots. These bony barbs help anchor ligaments, pulleys, and other connective tissue, but why do prairie dogs have them when muskrats don't? Were they inherited from a distant ancestor, or do they reflect a more recent evolutionary development. Even though the animals were long gone, their skulls told us a lot about the way they had lived. We'll look at fish and turtles in the next blog! Why so many prairie dogs versus other mammals? There is an active colony very close to the nest, just below some large power poles with great cross braces. The eagles can perch right above the colony and wait for an unwary prairie dog to get a little too far from its hole. Prairie dogs are also relatively large and meaty - a nice size dinner for the amount of energy expended catching it! Interested in ID'ing the skulls of North American animals? Check out Animal Skulls, a Guide to North American Species, by Mark Elbroch. We would not have been able to make ID's without it! 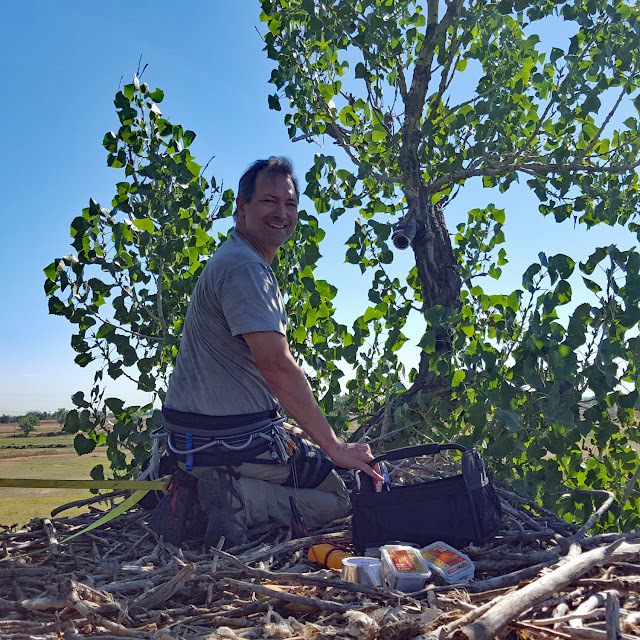 Back in late August, John and I traveled to Platteville, Colorado, to work with Xcel Energy employees Bill Heston, Tina Lopez, and Naresh Dahagama on an upgrade to the Fort St. Vrain Eagle cam. Over three days, we took down and re-positioned the existing cam, added a new PTZ cam, cleaned up the solar panel area, added two radios and a couple of networked video recorders so plant staff could watch their eagles from the lunchroom again, threw in a couple of network switches to tie everything together, and got an IP camera configured for the Fort St. Vrain owl nest. 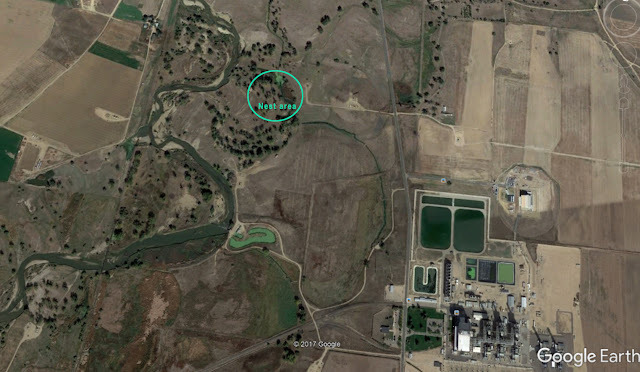 Those cameras can be watched here: https://www.raptorresource.org/birdcams/xcel-energy-cams/ or here: http://birdcam.xcelenergy.com/. We did the best we could to position all of the cameras out of poop range! So what does the area look like? The Fort St. Vrain bald eagles are nesting in a large cottonwood near the junction of the St. Vrain and Platte rivers. A variety of animals drink at the waterhole just below their nest, western painted turtles sun themselves on logs, fish swim in both rivers, and prairie dogs squeal and dig at a large colony roughly 1,000 feet away. Their grove is populated by cottonwood trees with an abundance of perches, which provide great places to sun and shade while searching for potential prey. Like many grassland groves, it is located on the east or leeward side of a river, which serves as a natural firebreak against fires driven by western winds. While life is not always easy here, the eagles' grove is a small oasis in the dry landscape around them. A look at the nest area. The plant is about 1/2 mile from the nest. The nest itself measures eight feet, one inch by six feet, seven inches by nine feet, ten inches. The total area is a bit tough to calculate since it sits somewhere between a triangle and an oval, but if I calculate for both and average them, I come up with around 30 square feet. 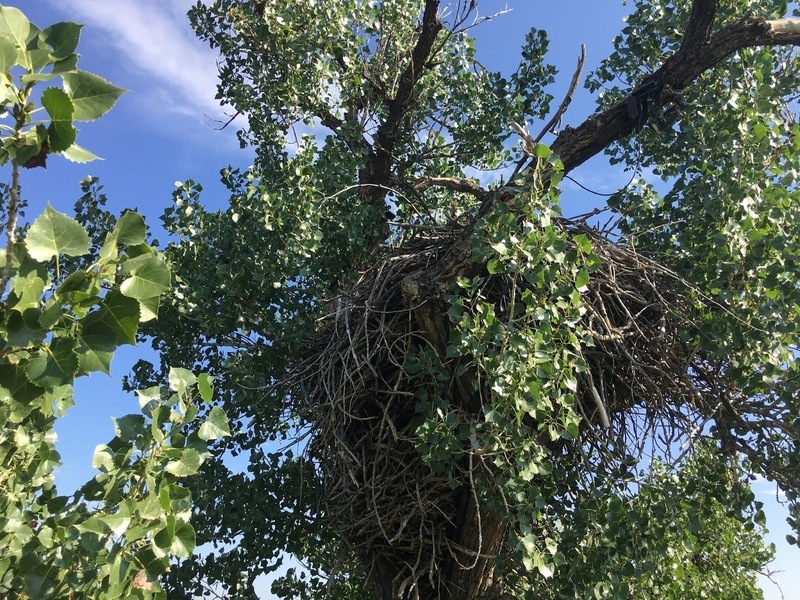 It is about 6.5 feet high, constructed almost entirely out of cottonwood sticks - far and away the dominant tree here - and contains at least three other bird nests. It has excellent flyways - perhaps due in part to stick-snapping and nest-building activities - and favorite perches as indicated by well-worn spots on branches right next to the nest. A look at the nest! What does the nest weigh? Using the method outlined here for calculating a cone - the closest shape I could come up with - yielded a total volume of 103 cubic feet (note that I calculated the radius by averaging the three measurements I had). Cottonwood weighs about 28 pounds per cubic foot, which yields a weight of 2,884 pounds...if the nest were constructed of solid wood. But it isn't, since the eagles weave branches together in a rough spiral. Once the solid weight is multiplied by the fibonacci ratio of 61.8%, we get an estimated weight of around 1,700 pounds. 61.8%, which is also referred to as the golden ratio, or the golden mean, turns up quite a bit in natural series, especially ones that involve spirals. Don't believe it? Check this out: The Golden Ratio In Nature. The Fort St. Vrain nest is larger but, thanks to its cottonwood construction, probably lighter than N2B in Decorah. Bill Heston. He worked with Bob and Joe on the original Fort St. Vrain camera system. I knew that the Fort St. Vrain folks liked their eagles, but I really didn't understand how dedicated they were until we got out there. 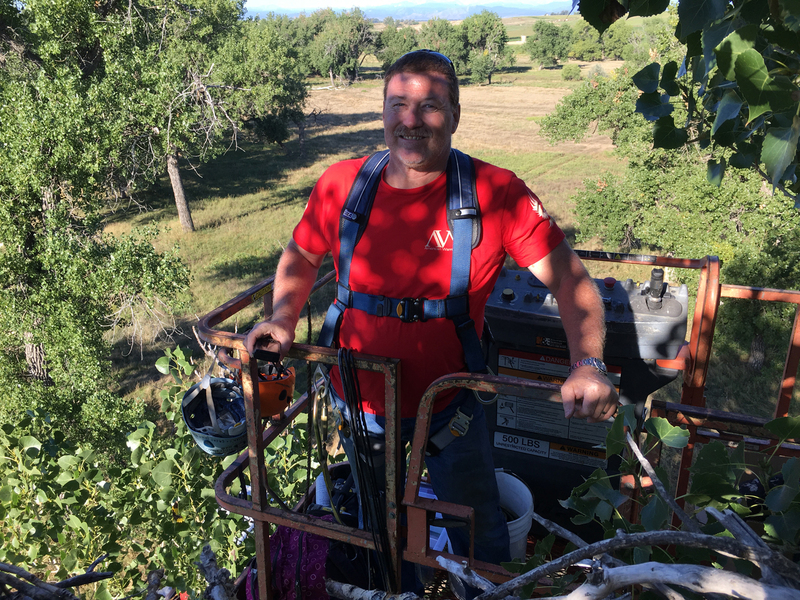 Bill Heston spoiled us with his expert lift operation - it was like riding an elevator to the nest! - and everyone was thrilled to be able to watch the eagles in the lunchroom once again. A thousand thanks to the Xcel Energy team for all of their great help and support! I'd like to come back and bioblitz your land...maybe next year? In addition to a juvenile bald eagle (we did not see either adult), we saw a great blue heron, a flock of wild turkeys, a belted kingfisher, red-tailed hawks, a woodpecker of some sort (it wasn't close enough to ID) prairie dogs, and a rabbit. Tina Lopez getting ready for the lift! While we were up in the nest, I decided to collect prey remains. We don't have the necessary permits to take feathers (of which I found only two, both belonging to prey), but there were plenty of skulls and a few turtle shells. I got them home, laid them out on a table, and started ID'ing them. You can read all about that in our next blog! John Howe in the nest!